(Newser) – Good news, nerds: Popularity in high school isn't predictive of long-term happiness, at least according to a study published Monday in Child Development. ABC News reports the study followed 169 high-school students for a decade starting when they were 15 years old. 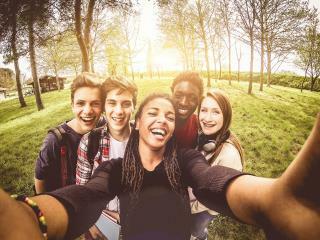 Researchers found high-schoolers with a few good, close friends were ultimately happier at 25 than those that were widely popular. "Youth with higher levels of attachment to their best friends appear to have better psychological health, psychosocial adjustment, and even a more adaptive stress response during adolescence," according to the study's authors. Or, as Huffington Post puts it: Teens will be better off if they have "a few tight BFFs." Oooohhhh. . .a "study!" Such "news" from Newser. If you turn out to be a democrat, you are always miserable. End of story. The most popular kid of my high school, voted "Mr. GHS" and accepting a full scholarship to play baseball for an SEC powerhouse school, dating the blonde model type who was "Miss GHS" rolled out to the woods and put a bullet in his own brain.